The man who blurted out on October 3, 2018 that “we’re a long way from neutral at this point, probably” formally stated this past Wednesday in his noon speech that the same FF rate is “just below the broad range of estimates of the level that would be neutral for the economy“. Just as no one paid any attention to his caveat “probably” on & after October 3, no one paid any serious attention to his “broad range of estimates” caveat. They took it as today’s FF rate is just below the neutral rate. BloombergQuint‏Verified account @BloombergQuint – Global economic growth may be slowing more than forecast only a month ago, warns International Monetary Fund. OK, Chairman Powell changed his mind. But he hasn’t done anything yet. So what is the big change? 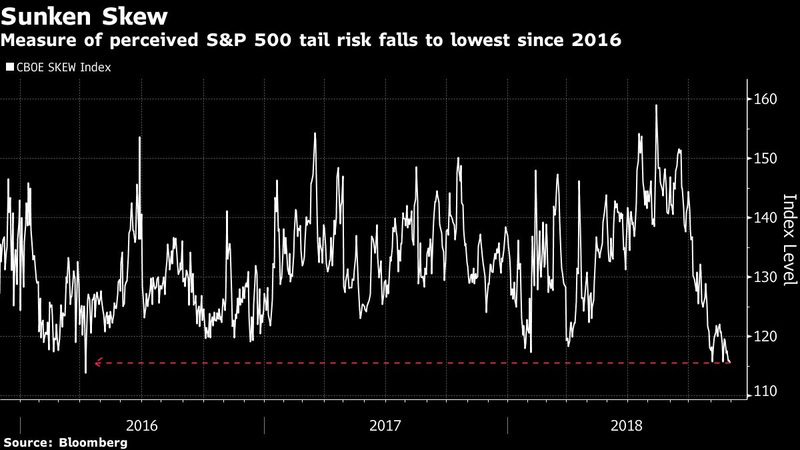 The real change is that Powell eliminated tail risk from markets. The October 3 statement had created the frightful specter of 4% FF rate & a high 4-handle Treasury curve. 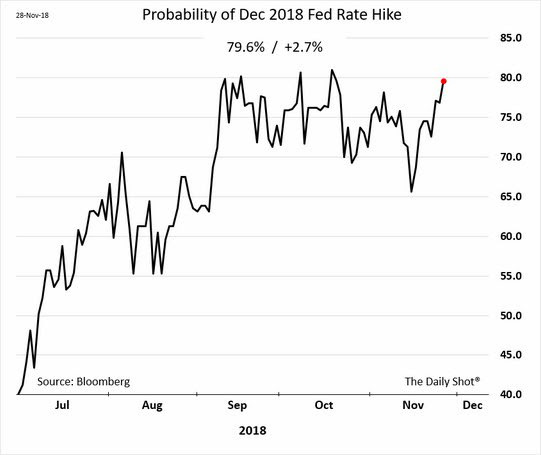 The November 28 statement eliminated that and created the calming aura of a 2-handle belly of the curve, an aura that tells market that draining of liquidity could soon be over. The Treasury curve seems to have serious doubts about the priced-in December rate hike. Why? Because one segment of the Treasury Curve is virtually near inversion. No, it is not the 10-7 year segment that Rick Santelli expected. It is the 3-2 year segment. The 3-2 year spread closed this week at 1.2 bps. This is a clear signal against raising rates in December. By the way, the 5-2 year spread closed the week at 3 bps. Treasury curve bull-steepened with both 30-10 year & 30-5 year spreads up 4 bps each on the week; High yield ETFs, HYG & JNK rallied by 1% on the week outperforming the 26 bps rally in Treasury ETF TLT; leveraged closed end credit funds, DPG & UTG, closed up 2.8% & 4.5% resp. outperforming unleveraged HYG & JNK; Stock indices had one of their best weeks ever with Dow up 5.2%, S&P 500 up 4.8%, Nasdaq Composite up 5.6% and Nasdaq 100 up 6.5%. The rally in Credit is important because it reduces credit-induced tail risk for markets. Stable to lower rates along the belly of the Treasury curve could result in greater demand for credit & hence enable robust credit issuance. Of course, by credit we mean US credit. Because what is happening in Europe’s financial system is almost ghastly. No wonder US banks are acting badly with Citi, the most global of them all, acting the worst. 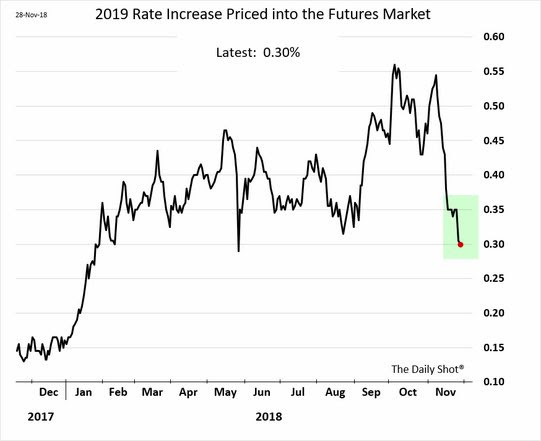 We know that Draghi has threatened to stop QE and even raise rates in 2019. 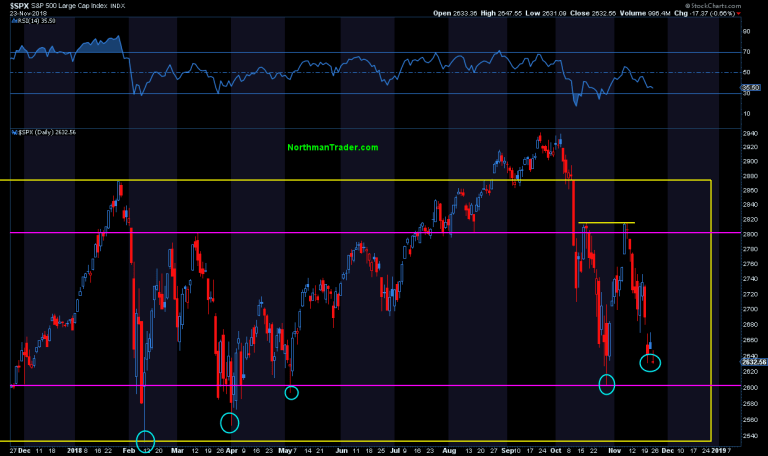 If Draghi actually carries out his threats, then US markets will be negatively affected. 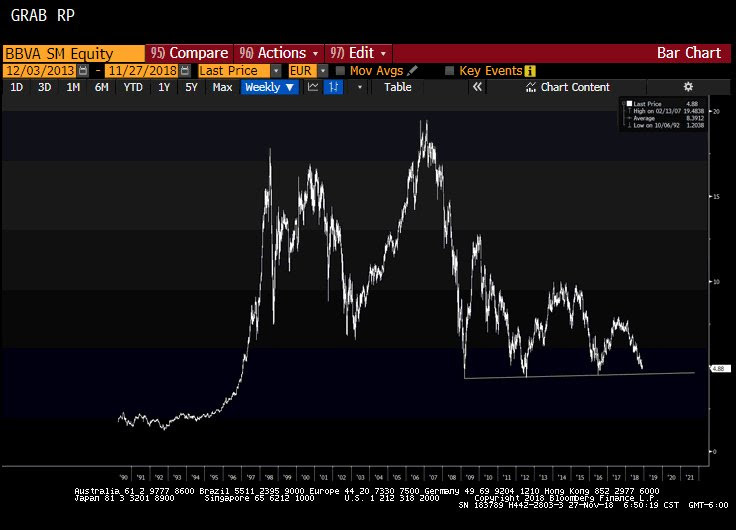 But can Draghi actually walk the walk in 2019 especially when the EU leadership could be rolling over in mid 2019 amidst the specter of Euro banks virtually collapsing? Raoul Pal‏Verified account @RaoulGMI Nov 27 – BBVA – This bank troubles me. The chart looks truly awful. It has systemic risk in Spain and is of global importance and still has a market cap of Euro 35bn. I know I keep pointing these out but no one is focussed on it…. So is it possible that Draghi backs off of his hawkish talk and we see both the ECB & the Fed switch to a done-draining mode? What could that do to US bond & stock markets with a disinflationary 2% GDP growth rate and a bull-steepening Treasury curve with stable credit? And what pattern might stock markets be suggesting? And many hurdles stand in the way including next week Non Farm Payroll report, the FOMC meeting in December and, more immediately, this weekend’s US-China trade issue. The dinner between President Trump & President Xi and the situation it creates next week is totally binary and no one except President Trump really knows what might come out of it. But some smart people saw signs in markets that suggest a bullish result on Monday. Thomas Thornton‏ @TommyThornton Nov 28 – Current positioning: Equity now net long +13% on the Hedge Fund Telemetry Trade Ideas Sheet. Thomas Thornton‏ @TommyThornton Nov 29 Increased net long exposure to +24% today on the Hedge Fund Telemetry Trade Ideas Sheet. 3. 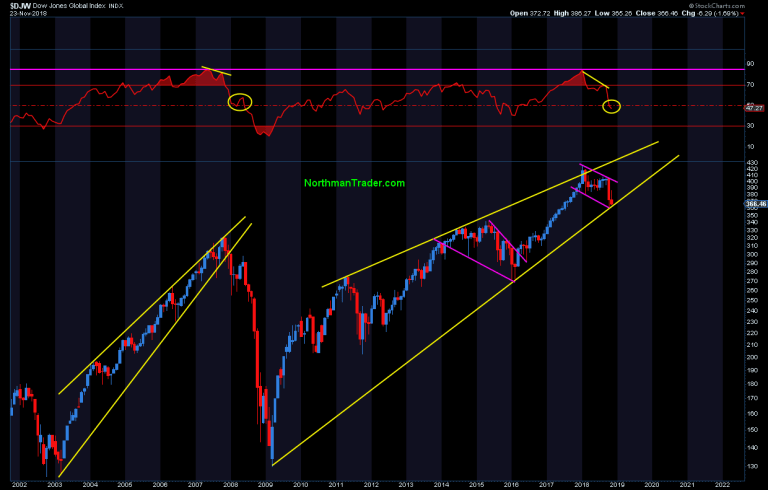 US Stocks – Bear Trap &/or Bull Flag? 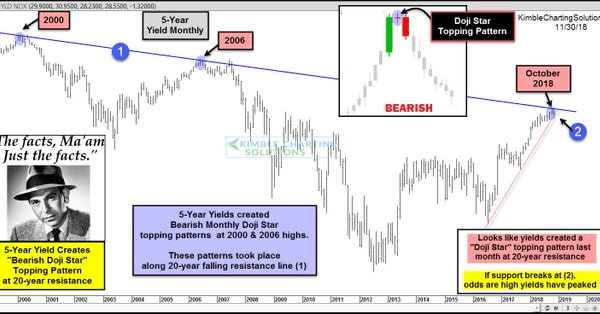 We think it is a big deal when a long term bull changes into a bear or when a long term bear changes into a bull. Below we discuss the latter. So where is the bear trap? How does another measure the potential of a rally? SentimenTrader‏Verified account @sentimentrader – Over the past 9 years, the S&P’s annualized return when SKEW was below 120 is +38.9%. When discussing EM stocks, don’t you have to begin with the Dollar? 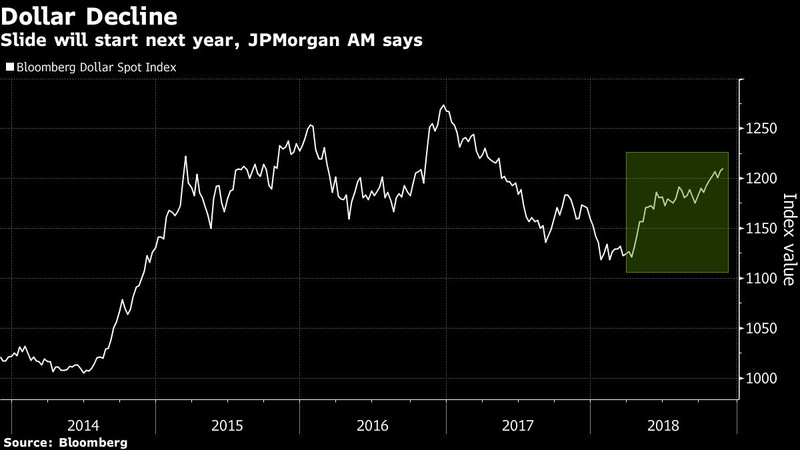 Ruchir Sharma of Morgan Stanley Investment Management called the Dollar “very expensive” and said he expects 20% downside in the Dollar over next few years. Conversely he thinks the Mexican Peso is way oversold. He sees an extended period of de-globalization in which previous winner (China) will lose and previous losers, especially Mexico, will benefit a great deal. That is why Mexico is his favorite emerging market. He also likes Vietnam, Indonesia and Malaysia. What about Mr. Sharma’s motherland? Business Standard of India reported that the Indian Rupee was up 5.9% in November, its biggest monthly gain since January 2012. Naturally, right? Not just the fall in Brent but also the fall in US rates. So how has the India Nifty performed? Peter Brandt‏Verified account @PeterLBrandt – Nov 27 – The Nifty 50 is an index that loves huge classical charting events. 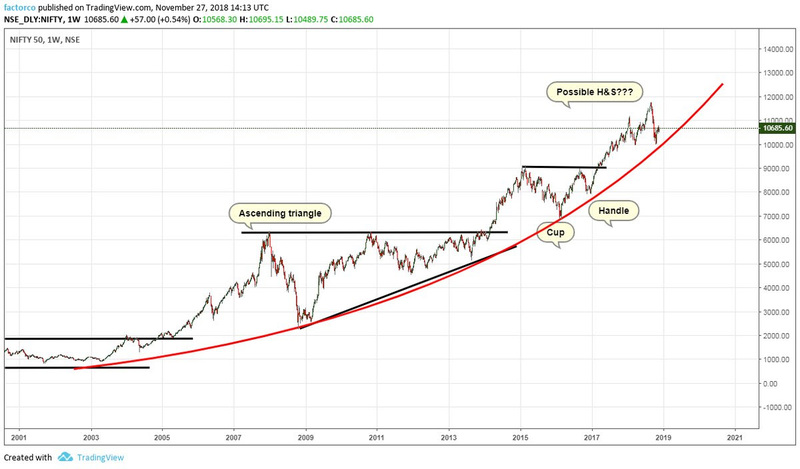 Dominant chart construction remains the parabolic advance. 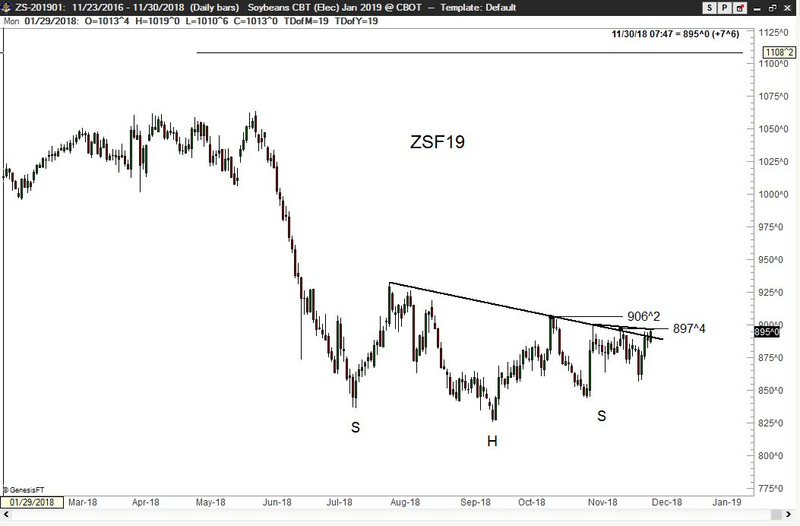 The H&S is not a prediction, but a “what-if” narrative. Any one who has watched Larry Kudlow on TV can see what a smart player he is. In an industry with huge egos and intense backstabbing, Larry Kudlow reportedly is liked by virtually all. Jim Cramer and he are probably poles apart. But they were able to jointly produce a show that changed CNBC’s post market franchise for ever. And it seems Jim Cramer and he genuinely like each other, another rare commodity in the TV business. As Presidents Trump & Xi sit down to a dinner with both geopolitical & market impact, we can’t help admiring how Larry Kudlow has succeeded in the Trump Administration. If you notice, no one makes a public snide comment about him, a rarity in an administration in which negative comments fly with abandon. We don’t know of course but it seems from the outside Kudlow’s ability to get liked despite his opposing views has stood him in good stead. & We are not scared to admit it publicly?